It was almost a year ago when an unexpected 2 a.m. phone call woke William Dice. What was supposed to have been a drug deal was in fact a robbery, police said. It happened in a vacant Dayton apartment building on Victor Avenue in the Dayton City Police Department’s (DCPD) Fifth District, considered the most violent and drug-infested area of the city. Dice’s 30-year-old son, Benjamen Dice, a handsome, blonde-haired, former point guard for Bellbrook High School, arrived at the nondescript brick building June 19, 2006 with two others, ostensibly to buy drugs. He entered alone. When he exited, he was staggering, blood spilling on the hallway walls, the entranceway, and the cement. Neighbors watched in horror as he collapsed in the grass. He kept trying to stand, falling each time. As Benji bled to death, his killer fled through the apartment building’s back door, through a nearby garage and into an alley. At the time the ambulance was racing with his son to Miami Valley Hospital, William Dice was in a Kettering church attending a 12-step meeting for family members of alcoholics and addicts. He didn’t learn how his son died until early the next morning. Even today, after the police investigation and multiple court hearings, he still knows little about why. Only one man knows for sure: Darnell Valentine, the man that gunned Benji down. But Valentine isn’t talking. He has pleaded guilty to aggravated burglary and murder and will be sentenced next month to not less than 15 years to life, but he hasn’t testified and he never will. Today, Dice is left with little more than rumors and speculation about that fateful night. Ultimately, all he’s sure of is that his son’s murder was drug-related. Efforts at drug control have been in effect at the federal level for more than a century, but the modern war on drugs began in 1971 when President Nixon proclaimed drug abuse “America’s public enemy number one,” and the federal government’s official policy became one of zero-tolerance. While the successes and failures of the so-called “War on Drugs” remain difficult to measure, it’s safe to say that now, 12 years past deadline, America is far from drug-free. In the political climate of the 1980s and 1990s, the outcry from the antidrug lobby reached near hysteria. The media made use of such hyperbolic terms as “plague” and “epidemic” to describe the prevalence of drug use, and stories about the War on Drugs were everywhere – just as stories about the War on Terror are today. At the moment, with the clamor about terrorism and the fighting in Afghanistan and Iraq, it’s easy to forget the War on Drugs is still being waged. Tens of billions in federal funds have been spent on counter-narcotics enforcement with mixed results. According to the National Drug Intelligence Center, despite record numbers of interdictions and seizures, cocaine availability in the U.S. is largely unaffected, and MDMA (Ecstasy) trafficking has been on the rise since 2004. While Americans are spending less money on illegal drugs – $63.2 billion as of 1999 according to the ONDCP – heroin and cocaine are cheaper today and purer than ever. And locally, the picture is grim. Hit hard by negative population growth, the loss of manufacturing jobs and the migration of service jobs to the outlying suburbs, Dayton has seen a 6.4 percent increase in violent crime (compared to a 3.7 percent increase nationally) for January-June 2006, according to Preliminary Crime Statistics compiled by the FBI. Already this month in the Fifth District, three teens were wounded in a drive-by shooting and an 18-year old was fatally shot by a Dayton police officer. 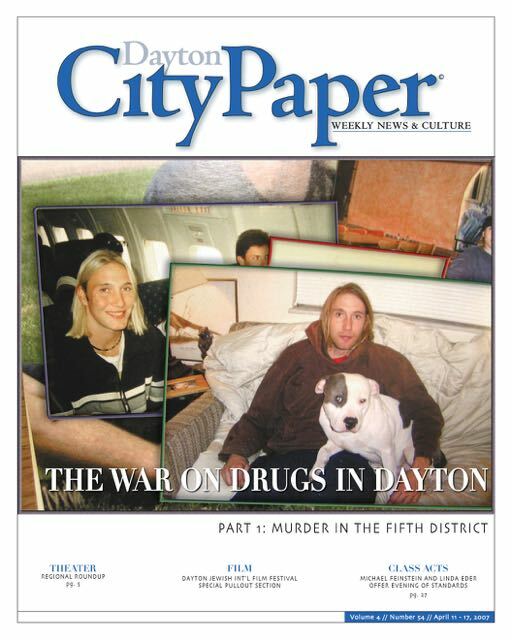 A 2005-2006 survey of 1,757 individuals living within the Dayton city limits prepared by the Center for Urban & Public Affairs at Wright State University showed, “more than half [59.2 percent]… believe that drug sales and/or use… are a big problem or somewhat of a problem in their neighborhood.” This is a 15 percent increase from 2003-2004. In addition, statistics from Dayton’s Crime Analysis Unit covering the years of 2002-2006 show an increase between these five years of drug/narcotic offenses in the whole of Dayton by nearly a thousand, rising from 1,916 in 2002 to 2,903 in 2006. In the Third and Fifth Districts alone, drug offenses have also risen dramatically with 299 and 271 offenses respectively. In 2006, the Fifth District tied with the Third for numbers of homicide offenses (15), and had the most robbery violations (265), weapon violations (216), and burglary/breaking and entering offenses (1,124) out of the six districts that comprise the DCPD jurisdiction. But statistics by themselves are rarely cut and dry, and drug activity in particular is notoriously difficult to measure. The DCPD crime data, which represent crimes – not necessarily arrests – seem to indicate one of two things; either during these years the DCPD has gotten much better at fighting drugs or drug activity has been steadily increasing. Then again, it could be both. “Part of it is our guys are working extra hard,” said Lt. Patt Welsch, Commander of the DCPD Narcotics Bureau, which conducts buy/bust operations, and surveillance takedowns in order to identify, apprehend and prosecute drug offenders. While Welsch takes issue with the interpretation that drug activity has been on the rise in West Dayton, he admitted his bureau has been concentrating its efforts there. William Dice holds a photo of his son, Benjamen Hugo Dice. The last time William Dice saw his son was Father’s Day 2006. Several months earlier, Benji had returned from Colorado where he had been living for about four years working as a house framer. He had run into financial troubles and returned to Ohio to regroup. He moved into a house on Riverside Drive in Dayton, but after the garage was burglarized and some $3500 worth of tools stolen, Benji moved once again – this time to his father’s small Kettering apartment. “He was having a tough time to begin with, and he was down on his luck,” said Dice, who believes his son was also struggling with addiction. When a gallstone migrated from Dice’s gallbladder to his bile ducts and lodged there, Dice, 62, was admitted to the hospital with acute pancreatitis. Benji visited him every day. After three operations and almost a month in the hospital, Dice was released. By that time, Benji had moved into an apartment in Miamisburg with his girlfriend. On Father’s Day, Dice had dinner with Benji and other family members. A little more than 48 hours later, he would receive the call that changed everything. He caught the story on the local news, saw the vacant apartment building roped with police tape, his son’s blood smeared on the hallway wall and front steps. Neighbors interviewed by television station WHIO said much of the area’s drug activity took place in the building across the street, but would not allow their faces shown on TV. Dice and his other son paid a visit to the apartment building. These days, Dice has his own ideas on the War on Drugs, and he’s doing what he can to spread the word. He knew next to nothing about computers when he first started building the online memorial to his son, www.flybenji.org, named in part for Benji’s blue pitbull, Fly. He has placed print and online ads with the Dayton Daily News to promote flybenji.org, which he intends to serve as a drug awareness and addiction recovery resource. He believes addiction is the real problem. Instead, Dice is a proponent of such radical measures as mandatory drug testing for all U.S. citizens and forced recovery for all addicts, though he recognizes such measures are probably unconstitutional and unlikely ever to be put into effect. Dice says addiction is a form of mental illness and those that suffer from it should be put into recovery programs, against their will if necessary.